Railways have an innate fascination for many local historians; they played an important part in shaping the communities and environment we inherited from the 19th century. The Wemyss Bay line is a good example of this. But this particular railway’s role in land transport is complemented, and largely explained, by its place in the equally evocative story of the development of Clyde ferry service. In bringing these two elements together, and relating them so clearly tot heir local and national context, Archie Clark has crafted a book with a broad appeal both to students of transport history and to those with a more general interest in the development of the west of Scotland. 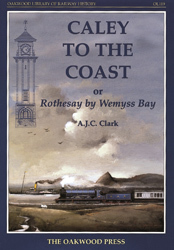 As the author is able to remind us from his personal involvement in the restoration of the magnificent terminal at Wemyss Bay, some of the history of the line is very recent. It is barely a decade since serious consideration had to be given to cutting the branch short because of the conflicting financial demands of maintaining a modern public transport network and preserving the railway’s architectural heritage. Fortunately this threat is now behind us, and the railway to Wemyss Bay continues to perform its traditional function of maintaining an essential link with the Rothesay ferry. Indeed, the terminal building and the linked pier and station are a firm reminder that the concept of integrated transport is not a modern invention. The branch’s wider role, as part of the Strathclyde Passenger Transport network, is not simply rooted in history. Its continuing evolution is symbolised by the replacement of the original Blue Trains and new stations on the line. A5 format, 320 pages, 200 photographs / maps / plans etc.